Netflix keeps strengthening its position as the go-to platform when people want to catch up with the latest series and movies. 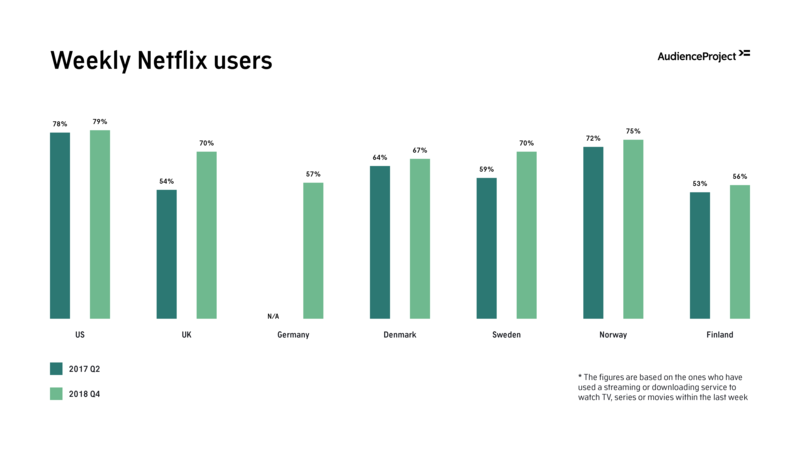 In all countries surveyed, the number of people watching Netflix has increased since last year and it is now the number one streaming service in all countries – except Finland where Yle Areena takes the lead. Besides Yle Areena, the streaming services provided by the national public service broadcasters are generally doing well. Despite a slight decrease compared to last year, BBC iPlayer in the UK, DR TV in Denmark, SVT Play in Sweden and NRK TV in Norway are the second most used streaming services in their respective countries. In the US and Germany, another giant – Amazon Prime Video – takes the position as the runner up. Actually, Amazon Prime Video is the streaming service that has seen the most growth since last year in both the US (31% growth) and the UK (33% growth) and is at the same time very close to being the most used streaming service in Germany indicating that Amazon Prime Video – at least outside the Nordics – will be the most obvious competitor to Netflix in the nearest future. Netflix’ leading position on the streaming market is clear proof that its strategy of focusing on growth through investment in content rather than hosting ads has been right. However, during summer last year, Netflix did test commercials for other shows between episodes. A lot of users were not pleased by this to say it the least and in our study, we also show how Netflix should be careful about going down this road. When asked whether the Netflix users would stop watching content on Netflix if the company were to add commercials into its streaming service, more than half – and in some countries up to two thirds – confirm that they would do this. 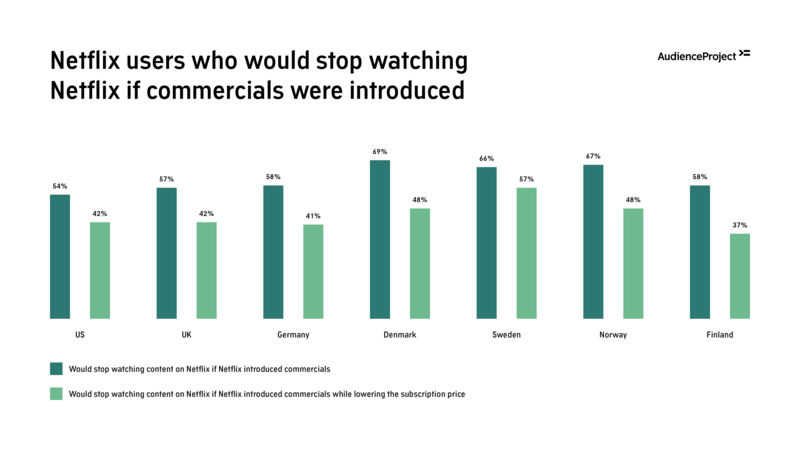 And even when presenting the Netflix users for a scenario where Netflix lowered the subscription price while introducing commercials, around half still confirm that it would make them stop watching content on Netflix. When looking at the findings above it becomes clear that both broadcasters and advertisers alike need to work hard to ensure that campaigns are relevant, once again highlighting the growing importance of targeting to create relevance in advertising. The study is based on more than 16.000 individual survey respondents across seven countries; The US, the UK, Germany, Denmark, Sweden, Norway and Finland.